 We are so excited to share The Jansma Print Collection at the Grand Rapids Art Museum with the world through this website. 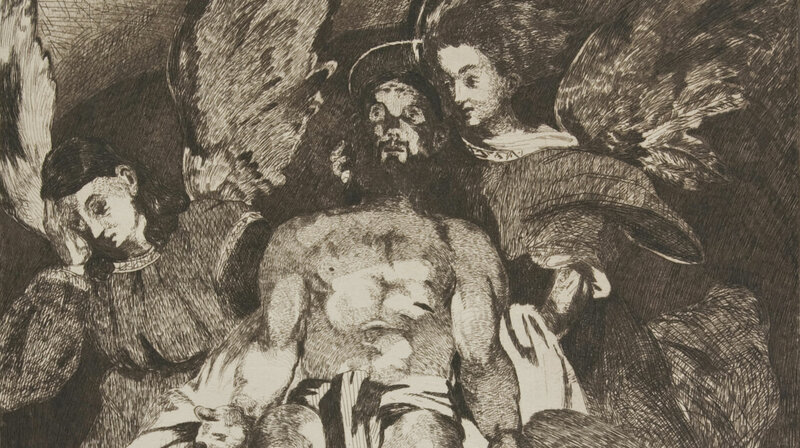 Initiated in 2005, this grouping of etchings, engravings, and woodcuts by master artists who have been inspired by Christian faith and Biblical themes, is the highlight of the Museum’s Works on Paper Collection. The recent gift of twenty-four works forming the complete series The Flight into Egypt (1750-1753) by Giovanni Domenico Tiepolo completes one of the Jansma Family’s goals—to include masterpieces of printmaking from the sixteenth to the twentieth centuries. A dynamic holding of graphics that now includes fifty-seven prints, The Jansma Print Collection is also recognized for the superior quality of each impression, and is envied by print curators at some of the world's largest museums. I encourage you to dive into the high-resolution images presented here, enjoy the curator's commentary, and explore the supplemental information that illuminates the art and history of these treasures.  We have also created an iPad app, which you can download here. Beyond that, I invite you to the Grand Rapids Art Museum to enjoy the actual prints. Works on paper are among the most fragile of the Museum's treasures, so as a result they are on view in our galleries only periodically. 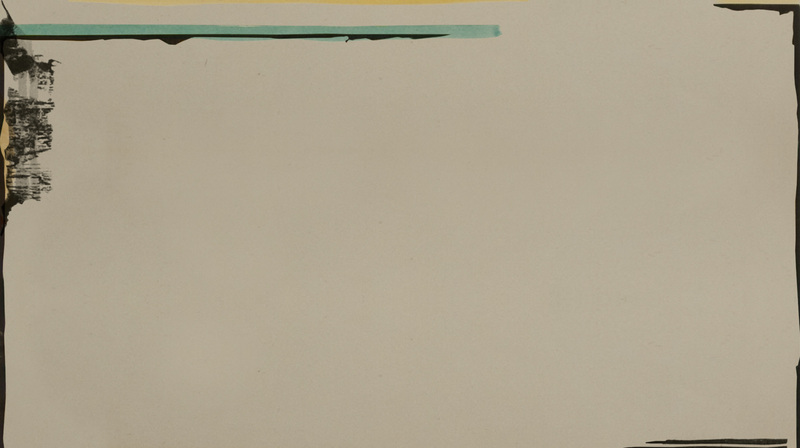 If they are not hanging on the walls of our museum or on loan to another, I encourage you to view the works in the tranquility of the Jansma Family Works on Paper Study, open to the public several days a week and by appointment. We are indebted to the Jansma Family, especially Cate and Sid Jansma, Jr., for their generosity, vision, and faith. The passion they share for art, history, and spirituality is contagious, and their gifts to the Museum have resonating effects for those who have been able to see these prints first-hand. In the video interview included here, you can “meet” them and see this commitment first hand. The expansion of GRAM's Digital Media Program seeks to broaden exposure to our history, our collections, our scholarship, and our educational outreach—so that the world can benefit from our mission to inspire discovery, enjoyment, and learning about art. We are grateful to the Jansmas for supporting this forward-focused vision, and to donors to our Fund for Excellence in Teaching and Technology. This project would not have been possible without the hard work and enthusiasm of the Museum's wonderful staff, especially our Curatorial, Education, and Digital Media teams. I am grateful to Cindy Buckner, Associate Curator, for her stewardship and scholarship of the Collection; to Jon Carfagno, Director of Education, for his commitment to expanding learning opportunities and embracing digital opportunities; and to Alexander Paschka, Manager of Digital Media, for directing this project. We have been glad to collaborate with noted Grand Rapids creatives at Conduit Studio in the design and production of this publication and website. 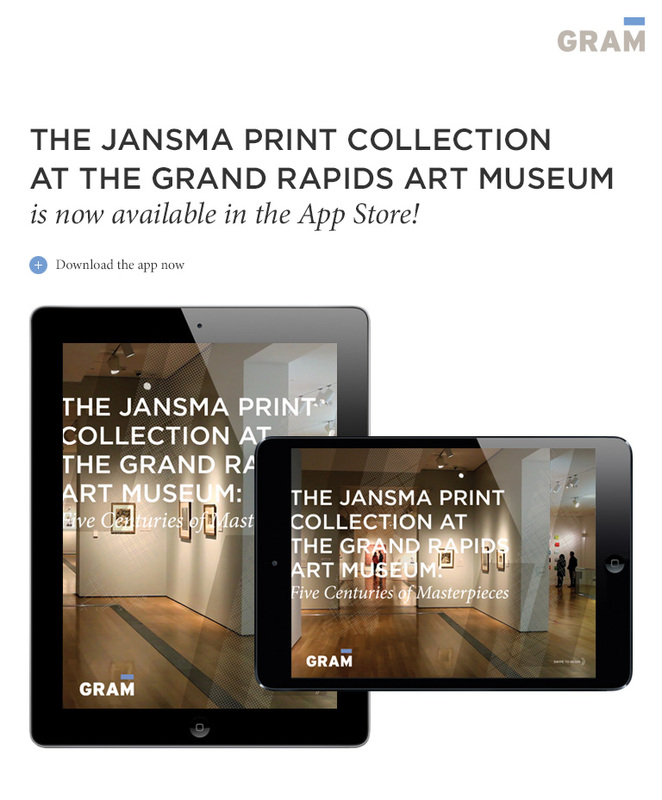 Welcome to the Jansma Collection at the Grand Rapids Art Museum! 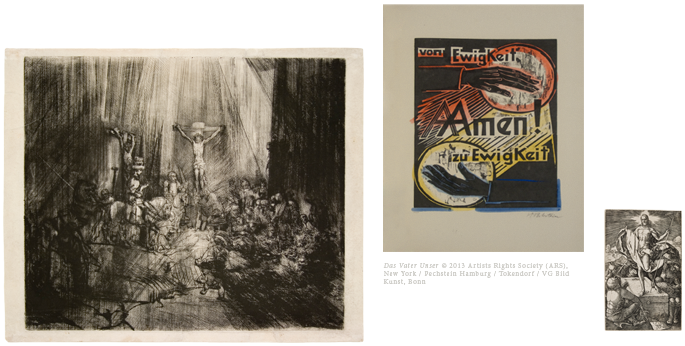 The Jansma Print Collection of the Grand Rapids Art Museum was established to bring together prints by art history’s most celebrated artists who have been inspired by Christian faith. The five artists currently included in the growing collection were chosen to represent a span of centuries, from the sixteenth to the twentieth. Diverse in nationality, style and technique, these outstanding works of art speak to the enduring message of faith throughout the ages. The Jansma Collection is recognized for the superior quality of each impression, constituting a masterpiece collection of prints. The sixteen engravings comprising the Passion of Christ by Albrecht Dürer (German, 1471–1528), and Christ Preaching (La Petit Tombe) by Rembrandt van Rijn (Dutch, 1606–1669) are superlative impressions of rare and important Old Master prints. 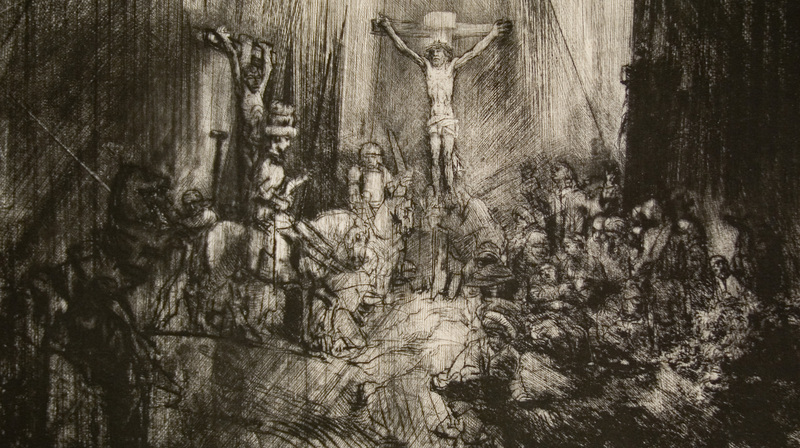 The Jansma Collection also includes the most important print in the Museum’s collection and one of the greatest in the history of art – Rembrandt's The Three Crosses, fourth state. A rare and early impression, the Jansma Three Crosses is one of the finest known impressions in the world of this outstanding print. The next three centuries are represented by the full series of The Flight into Egypt by Giovanni Domenico Tiepolo (Italian, 1727–1804), the rare Dead Christ with Angels by Édouard Manet (French, 1832–1883), and the exquisitely preserved The Lord's Prayer by Max Pechstein (German, 1881–1955). This digital publication provides the opportunity to supply additional, detailed information about these prints. Where applicable, the viewer will find documentation of the inscriptions written on the prints and the watermarks in the paper, the provenance (history of ownership), a bibliography of published references, and curator’s comments regarding subject, style or technique. It is our intention to update this publication as new information emerges. The Museum is very proud to add these masterpieces of printmaking to its already distinguished collection of works on paper. Central Europe, and Germany in particular, was a center of intellectual activity, technical innovation, and religious upheaval in the sixteenth century. In Wittenberg, Martin Luther set in motion the events leading to the Protestant Reformation, asserting the authority of the Biblical Scriptures over that of the clergy. Throughout Central Europe scholars and leaders embraced the humanist philosophy imported from Italy, ideas that raised to new importance the dignity and talents of individual people, as well as the documentation of human knowledge. Within three decades of the 1455 Gutenberg Bible, printing presses throughout Europe made the Bible accessible to the public and a primary narrative source for artists. Albrecht Dürer, the most important artist of the Northern Renaissance, created meticulous woodcuts and engravings of the Old and New Testament that depicted the life of Christ and stories of the prophets and the saints as spiritual dramas set in the physical world. Dürer was the first artist in northern Europe to transform the arts from the product of the medieval workshop to a conscious expression of artistic genius. He understood the rules of perspective underlying Italian Renaissance art and applied them to depictions of individualized people and landscapes. 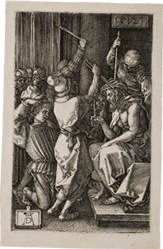 Alongside a number of prints issued individually, Dürer produced multiple series of religious subjects. Four great devotional series were done in woodcut: the Apocalypse, the Large Woodcut Passion, the Small Woodcut Passion and the Life of the Virgin. He produced only one Passion cycle in engravings. 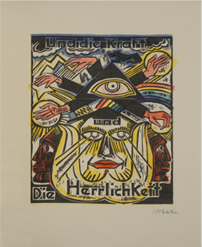 Through his woodcuts and engravings he became an international figure, supplying iconographic models to artists throughout Europe and setting new standards of technical mastery. 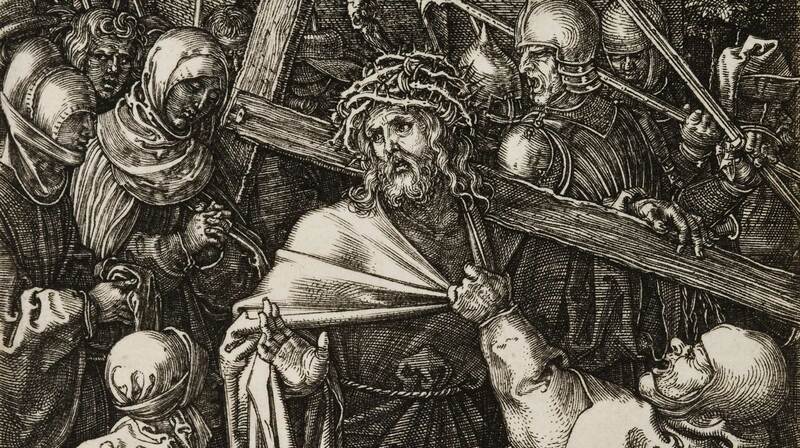 The Engraved Passion is Dürer's earliest work in the medium of engraving, and later influenced Rembrandt's prints. 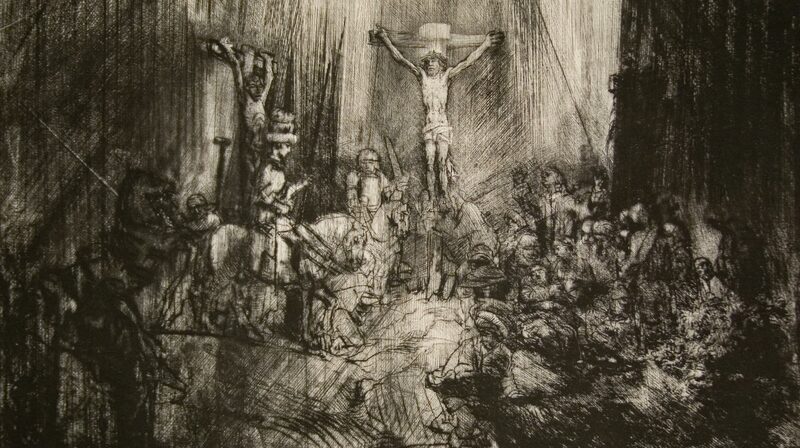 The prints for The Engraved Passion are somber and restrained in their presentation. The fineness of the engraved lines enabled Dürer to achieve remarkable detail and to suggest in these scenes an almost spiritual light. The same delicacy also made possible a greater exploration of facial expression, thereby expanding psychological dimensions. Despite their miniature size, the prominence of the figures, which occupy the majority of the pictorial space, gives the images a compelling forthrightness and grandeur. The Passion is the Christian theological term used for the events and suffering of Jesus in the hours before and during his trial and crucifixion. The accounts of the Passion are found in the four canonical gospels: Matthew, Mark, Luke and John. The first three of these books give very similar accounts, while the Gospel of John provides additional details. The subject of Dürer's final print of the series, St. Peter and St. John Healing a Cripple, told in Acts 3:1-10, has no direct relationship to the Passion. 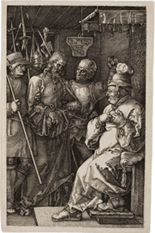 It was likely the beginning of a new series representing the Acts of the Apostles that Dürer began but abandoned, but has been included in the Passion sets due to its cohesiveness of style and format. 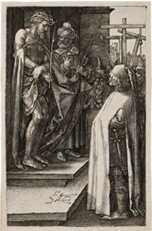 A contemporary bound copy of the Engraved Passion, held at Princeton University Museum, provides an example as to how educated people of Dürer's time viewed the series as an aid to prayer. It is bound in a leather binding and the engravings are printed on sheets with wide margins. On the facing page of each image is a handwritten prayer in Latin. Johannes Ockeghem was the leading figure of the Flemish School’s second generation during the Renaissance era. The Flemish composers largely returned to church music, but at the same time they made bold strides into uncharted territory. Technical advances in composition once unthinkable were now commonplace. Writing for four distinctly separate voices, Ockeghem developed his counterpoint as an intricate web of equally important, moving parts. In his “Missa prolationum” he employs an innovative technique called a “mensuration canon” where one melody simultaneously unfolds in four voices not only starting on different notes, but also moving at different speeds. The seventeenth century is considered the Golden Age of Dutch art. Wealthy merchants became key patrons of the arts in the newly independent Dutch Republic. Schools of painting in a variety of genres arose in cities such as Amsterdam, Delft, Haarlem, Utrecht, and Dordrecht. While European art was generally Baroque in style during this period, most art in the Netherlands continued the tradition of detailed realism. Rembrandt was the most important and influential artist of a classic moment in history known as the Golden Age of Dutch art. He also transcends that moment as one of the greatest artists who ever lived. 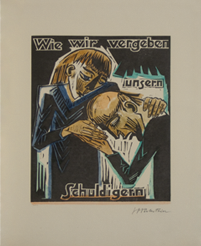 Of particular significance is his work as a printmaker. Almost all of Rembrandt's etchings were made as independent works of art; only a handful served as book illustrations. In his prints he was influenced by the work of earlier artists such as Albrecht Dürer, whom he deeply admired, but he advanced further in both his technique and his vision. In his paintings, drawings, and etchings Rembrandt depicted human situations that revealed a deeper internal drama. In biblical subjects he conveyed a deep human compassion and a profound spirituality. Rembrandt's earliest prints are executed in the highly theatrical Baroque style. During the 1640s he was increasingly influenced by the classical compositions of Leonardo da Vinci, Mantegna, and Raphael. From the 1650s forward, his mature work moved to greater simplicity in composition and greater innovation in technique. The Three Crosses embodies his highest achievement in printmaking for its strikingly modern ambiguity of space and time as well as its grand vision of human redemption in the intimate art form of a print. Scandinavian-born Dietrich Buxtehude was one of the greatest organist of the 17th century. His weekly concerts during Advent drew visitors from far and wide, most notably a young J. S. Bach who walked 250 miles to hear these stirring, free form organ fantasies which surely influenced him when he wrote the Toccata and Fugue in D minor. In this sacred cantata by Buxtehude, the restlessness of his improvisatory tendencies presents itself as a descending chromatic sequence snaking through the vocal line. This suggests the deeper drama of this music: the yearning and searching for peaceful spirituality through the veil of a musical landscape in flux. Northern Italy continued to serve as a thriving artistic center during the eighteenth century, despite the gradual decline of its political and economic stature. Venice was a cultural capital of Europe, home to great masters of painting such as Canaletto and the Tiepolos. The Rococo style, with its dynamic and asymmetrical swirls and flourishes, was prominent in painting, sculpture, architecture, music, and theater. Giovanni Domenico Tiepolo was one of the most important Italian artists of the eighteenth century. Primarily a painter, he quickly excelled at the technique of etching and completed over 175 etchings during his career. Domenico was the eldest surviving son of Giovanni Battista Tiepolo (1696–1770), the most renowned painter of 18th-century Italy. He entered his father's studio in the early 1740s, where he learned to draw and paint. From the age of twenty, he began to complete major paintings, such as the Stations of the Cross for the Church of San Polo in Venice. From 1750 to 1770 Domenico served as his father's assistant, while at the same time working as an independent artist. From 1750 to 1753 while father and son were painting the fresco decorations in the Würzburg Residenz, Domenico was also producing a large number of his own works. Tiepolo appears to have stopped creating art for a period of about fifteen years, after which he began drawing and painting in a distinctly different manner. In the 1790s he produced a sequence of frescoes of Punchinello, a clown from the Italian comic theater tradition, combining comedy and realism in a manner that poked fun at art's classical tradition. 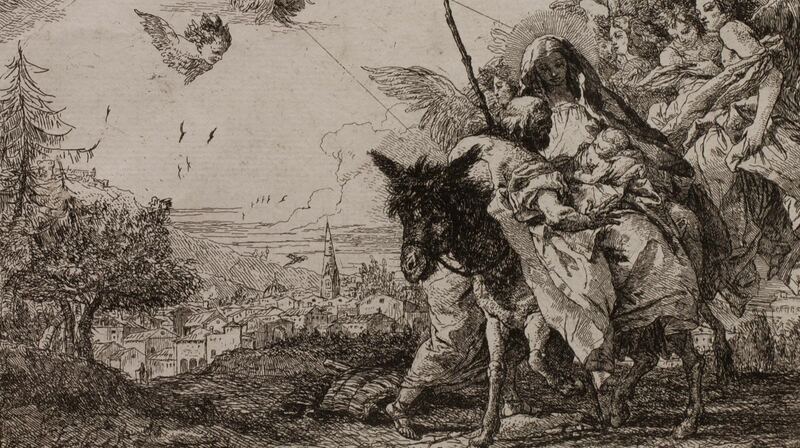 The Flight Into Egypt etchings are Domenico Tiepolo's masterpiece, created during a formative period of his career. By 1750 Tiepolo was a newly established artist, having trained under his father Giovanni Battista Tiepolo in Venice. At the time he was creating the Flight Into Egypt etchings, he was assisting his father with the frescoes for the palace of Carl Philipp von Greiffenklau, prince-bishop of Würzburg. Before leaving Germany in 1753 Domenico completed and published the twenty-four etchings and published them as Idee pittoresche sopra la fugga in Egitto (Picturesque Ideas on the Flight Into Egypt), dedicated to the prince-bishop. The story of Mary, Joseph and Jesus' flight into Egypt is told in the Bible: "When they had gone, an angel of the Lord appeared to Joseph in a dream. 'Get up,' he said, 'take the child and his mother and escape to Egypt. Stay there until I tell you, for Herod is going to search for the child to kill him.' So he got up, took the child and his mother during the night and left for Egypt, where he stayed until the death of Herod. And so was fulfilled what the Lord had said through the prophet: 'Out of Egypt I called my son.'" (Matthew 2: 13-15) A more detailed description of the Flight is provided in the apocryphal gospels, the texts of which had been used by artists as source material for centuries. Preceding Domenico, only one artist had executed an extended pictorial series of this subject. In the mid-seventeenth century Charles Massé etched twelve Flight into Egypt plates after paintings by Annibale Carracci. Domenico may have sought to honor his family's patron Carl Philipp with a print series that far exceeded the scope of all previous versions. The series reflects Joseph's changing role in the seventeenth and eighteenth centuries. Previously his role as a member of the Holy family was consigned to the background, but the ideas of the Counter Reformation raised Joseph to a new prominence. Most notably in two of his plates Domenico shows Joseph holding the Christ child in his arms, a meaningful sign of his increased status. With the Flight Into Egypt series Domenico Tiepolo applies masterful etching technique and careful observations of human expression and gesture to a biblical narrative, drawing out subtle nuances from the traditional story. During Giovanni Pergolesi’s short life he witnessed a rapid shift from the Baroque to the early Classical in music. Almost overnight public tastes shifted from what was considered old style to something fresher. Pergolesi was one of the first important composers of the new Italian comic opera style “opera buffa” which later reached its height at the end of the century in the hands of Mozart. The lighter, more immediately likable style of the early Classical era composers in Italy quickly spread throughout Europe. Pergolesi’s sacred “Stabat Mater” from 1736 is a prime example of something that might have received a more somber setting by an earlier composer. In the aria “Fac ut ardeat cor meum,” a pair of high voices (originally sung by male castrati) chase one another playfully with lighthearted imitation, trills in thirds, and a series of chain suspensions. Impressionists and Realists who sought to document the everyday world around them characterized that art of the second half of the nineteenth century in France. A great revival of the art of etching occurred at this time as well, and many painters in England and France took up the technique in the 1860s, inspired in part by a renewed appreciation of the art of Rembrandt. Édouard Manet was the most important figure in the emergence of French modernism. His early masterworks from the 1860s caused great controversy and served as important precedents during the development of Impressionist painting. Although associated with the Impressionists, he was never part of the movement. Trained in the traditional studio of history painter Thomas Couture, and inspired by the paintings of the Italian and Spanish Old Masters, Manet soon broke from his conventional training. He created large paintings of contemporary subjects, answering the poet Charles Baudelaire's call for a new type of art that captured the unique qualities of modern life. Manet was equally avant-garde in his stylistic approach to painting, creating dramatic contrasts of light and dark, and powerful patterns of flat color laid down with bold brushstrokes. 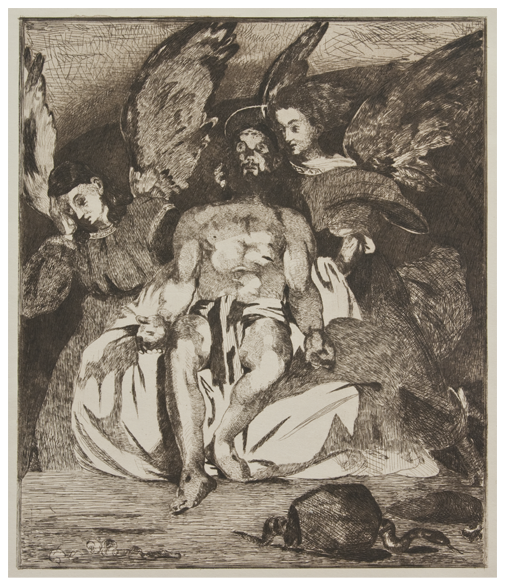 The masterful print The Dead Christ with Angels, was created from the largest copper plate Manet ever etched. Two elegantly rendered angels attend to Christ as he reveals the wounds of his Crucifixion. 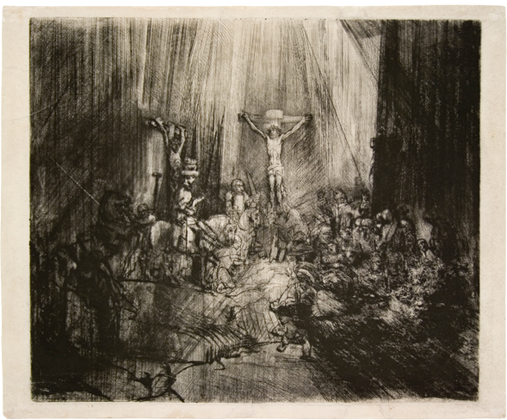 The intimate, atmospheric quality of the print, created by washes of aquatint, softens the lifeless physicality of Christ. The somber and elegiac tone of the scene anticipates the miracle of the Resurrection, a triumph over death and Satan referenced by the slithering serpent in the foreground. 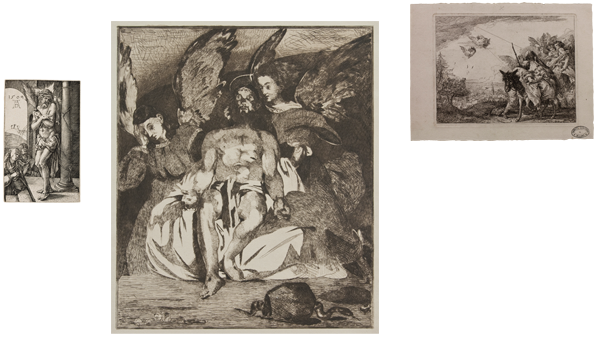 This etching is directly related to Manet's painting of the same title which he showed in the Paris Salon exhibition of 1864. Rather than serving as a reproduction of the painting, the print was conceived as a new interpretation of the painting. Unlike his contemporaries Mary Cassatt and Edgar Degas, who were prolific printmakers, Manet seldom executed prints, making the occasion of this print even more significant. Fewer than a dozen impressions of The Dead Christ with Angels exist. Exceedingly rare, this etching was privately published and never exhibited, only later claiming a distinguished place in the history of the western print. Gabriel Fauré was another transitional figure in music, half looking back at 19th century Romanticism and half looking forward to the unknown expanse that would become 20th century modernism. His greatest work, the Requiem in D minor, is scored for two soloists, chorus and full orchestra and it illustrates all the advances and subtleties of orchestration that composers could exploit as musical forces expanded during the 19th century. The final movement (translated as “May angels lead you to paradise,”) features a single soprano solo floating dreamily, colored by the other voices and iridescent textures in the orchestra. Expressionism developed as an avant-garde style in the first decades of the twentieth century, and was especially popular during the Weimar Republic in Berlin. Responding to a general anxiety about inhumanity and the loss of spirituality and authenticity in the modern world, Expressionist artists sought to convey meaning or emotional experience rather than physical reality. The style extended to a wide range of the arts, including painting, literature, theatre, dance, film, architecture and music. 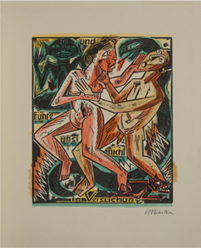 Max Pechstein was a German Expressionist painter and printmaker. His early contact with the art of Vincent Van Gogh encouraged his development of an expressionist style marked by bold color and angular form. 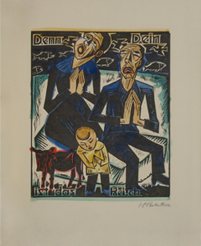 Pechstein was a member of Brücke, a group of artists who worked and exhibited together in Dresden and Berlin from 1905 to 1913. 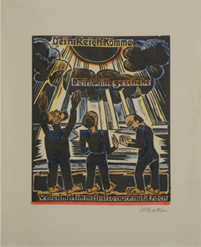 As the first modern art movement of the twentieth century, Brücke placed special importance on prints. 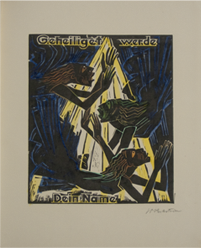 The woodcuts, lithographs, and etchings produced by its artists, including Ernst Kirchner, Emil Nolde, and Karl Schmidt-Rottluff, are a major contribution to the history of the modern print. Although committed to urban subjects and landscape, Brücke artists also had a profound interest in Christian themes. In this regard, they distinguish themselves in the history of modern art, which has primarily addressed secular life. Pechstein was one of the most important Brücke artists who incorporated Christian subjects into his art. 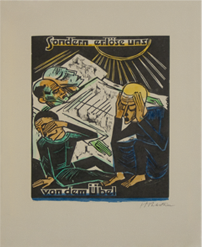 In the wake of the devastations of World War I, Max Pechstein left Berlin in 1921 to settle in the northern fishing village of Nidden. 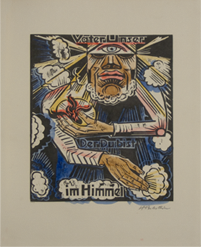 Here he turned almost exclusively to landscape and religious subjects, producing Das Vater Unser, one of his most celebrated works and a landmark in the history of twentieth-century religious art. 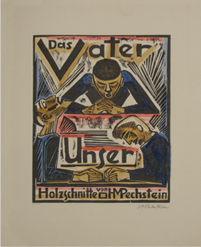 For the twelve woodcuts that compose Das Vater Unser, Pechstein turned to the archetypal prayer of Christianity drawn from the Books of Matthew and Luke. He selected Martin Luther's German translation rather than the Latin. 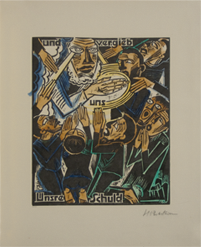 Pechstein's choice of this Biblical version stresses the popular or private devotions of Protestantism rather than the organized religious rites of Roman Catholicism. The artist's everyday imagery of humble and pious North Sea fishermen and their families caught in prayer reflects his choice of text. Stylistically, Das Vater Unser is marked by a graphic vocabulary of flattened shapes and broad black planes, with regularly patterned incisions and manipulations of forms derived from medieval and South Seas sculpture. 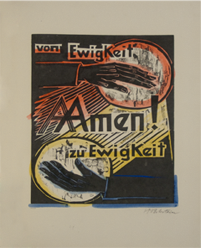 Pechstein's choice of strong color with which to embellish the black-ink woodcuts further emotionalizes the artist's fervent and deeply felt illustrations of the Lord's Prayer. 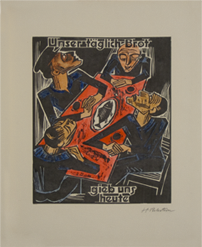 Das Vater Unser was published in an edition of 250: the first 50 prints were hand colored and individually signed and the remaining 200 were black and white. All of the arts took dramatic, even chaotic, leaps at the turn of the 20th century, and heated debate remains even today regarding the merits of some of these creations. Yet there is no doubt that the expressionist music of Arnold Schoenberg and his fellow “Second Viennese School” composers mimicked the chaotic swings of a society in continual upheaval. The first third of the 20th century saw worker revolts, military mutinies, revolutions, assassinations, a world war, financial collapse, hyperinflation, and the rise of Nazism. It is no wonder during this period that even its sacred music was so deeply imbued with angst. 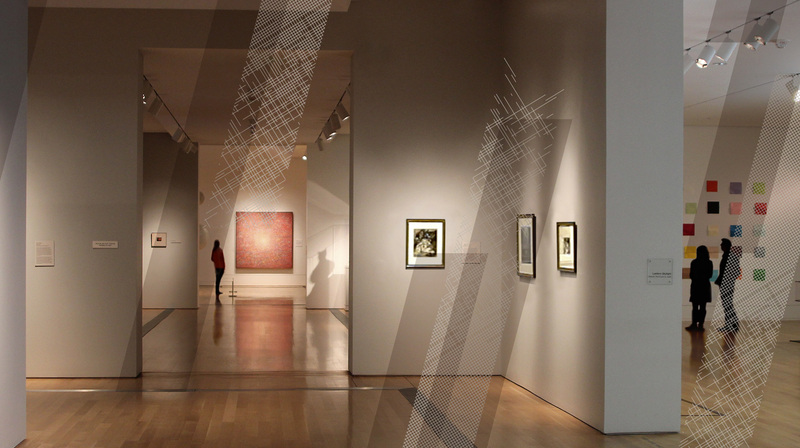 Experience fascinating exhibitions plus rich and diverse collections in the stunning architectural spaces of the Grand Rapids Art Museum. 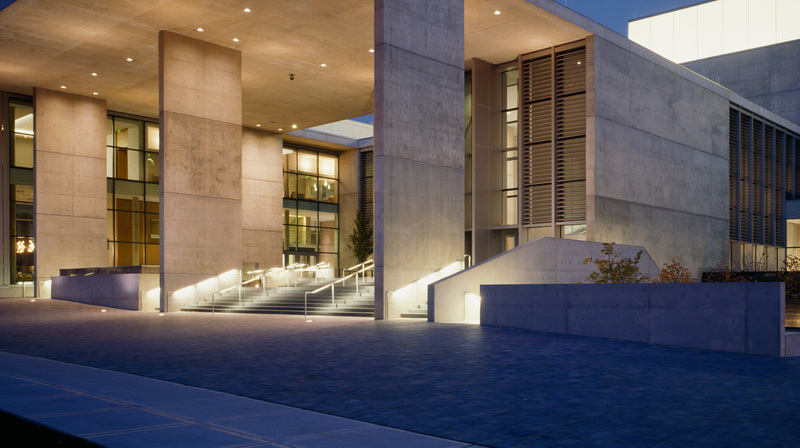 Anchoring the heart of downtown adjacent to Ecliptic, a city park designed by Maya Lin, GRAM's award-winning modern building is the world's first LEED® Gold Certified art museum. 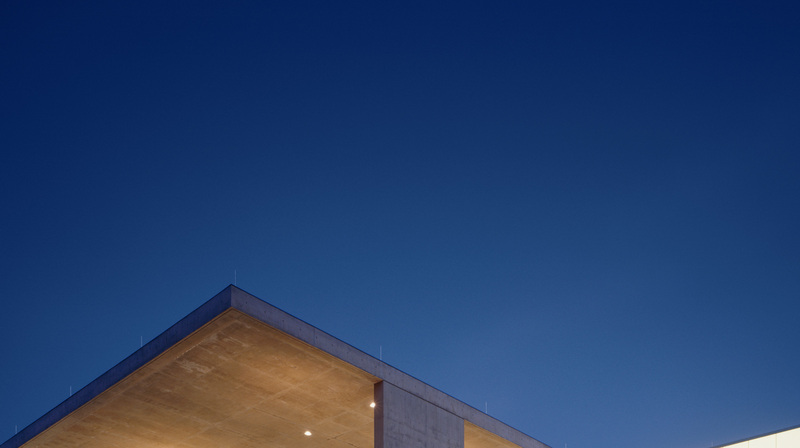 We invite you to explore three floors of art and design as well as to discover the range of tours, education programs, and resources that will enhance your visit. Parking is nearby, affordable, and easy to access. A world of creativity and surprises awaits, so allow yourself to be inspired by art of the finest quality. 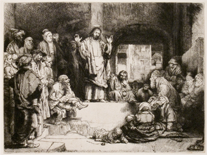 In our desire to reflect God's love to others and to be good stewards of the gifts God has given us, we wish to support the Grand Rapids Art Museum's acquisition of important woodcuts, engravings, etchings, and lithographs that reflect the Christian faith from the fifteenth century to the present. We give these prints with joy and gratitude for the divine gift of art that enriches our culture – and especially for the gift of God's Son, Jesus Christ, who is the subject of most of these beautiful works of art. We hope that the Jansma Collection will encourage reflection and dialogue throughout our community. There are many ways you can make a gift to GRAM that will not only support exhibitions and programs, but also provide opportunities for you to get involved. Please consider partnering with us as we continue our vision to serve as a welcoming and inclusive cultural gathering place. Your support helps bring this vision to reality.